Britney Spears Has Lost Her Friggin Mind! 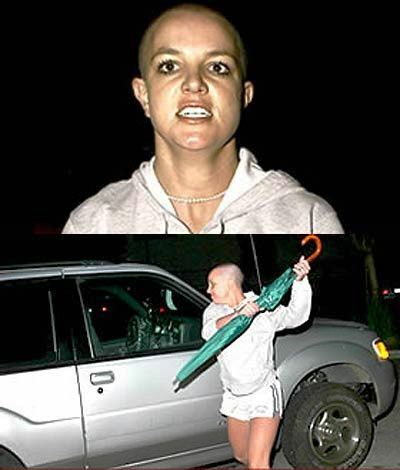 Okay, I don’t really want to kick someone when they’re down, but……OH MY GOODNESS BRITNEY SPEARS! What the heck kind of crazy colors is she seeing in her world? I actually had a conversation with my mom last night about the chaos that is Britney Spears. I made a comment that she’s just going through normal 25 year old newly single mother things. Apparently, my mother disagreed. She then went on her own rant about how Britney Spears had too much fame and too much money too young…and that she’s not like other single mothers because she has tons of money and can afford help. She has a point. I guess she would know she was once a single mother herself. Whatever the deep down reason is for Britney’s recent behavior, I am not shocked at all that she is acting this way nor am I surprised that we’re all lapping it up like bears do honey. I think we can all agree that the girl is currently whacked in the head and needs some serious help. My only real question at this point……where the HELL was Britney Spears’ mother six months ago before Britney headed down the track to Crazy Town and started being seen with career and life parasite Paris Hilton? I mean honestly! Where were the parents the first two times Britney Spears entered and exited rehab? Why only after she is caught beating the car of a paparazzi with an umbrella outside Kevin Federline’s house (after K-Fed wouldn’t let her in to the see the kids) does Britney’s mom finally drive her to rehab herself? Hang on. I need to look out my window. Phew. For a minute there, I thought pigs were flying. I never thought I’d see the day when Kevin Federline was the more responsible parent. previous post: Bald Britney Spears Enters Rehab! No doubt Britney’s not in a responsible state of mind. Seems to me, she’s been a little whacko when she married K-Fed. Even more so since she divorced him. Post Pardum depression? Possibly. However, I tend to agree with your mom. Britney had way too much, too soon and no appropriate guidance in what to do with all that stuff. I have no doubt her family loves her, but I think they got caught up in the glitz and glamor too. Her second trip to rehab, I was hoping she could “make good” on the treatment. It wasn’t long before photos of her smoking a cigarette outside during rehab surface for public viewing. I can only imagine how frustrating that would be; trying to get her act together but getting no privacy in the process. So she checks out, sees a lawyer, beats up a paparazzi vehicle then goes back into rehab. I just hope she can stay the course (!) and the paps would leave her alone. I wish her the best of luck. 51 queries in 1.723 seconds.